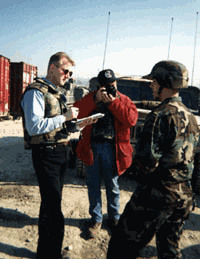 Potomac News photographer Chris Moorhead and I spent over a week in Bosnia-Herzegovina in March 1997, covering the day-to-day life of Virginia soldiers serving as part of SFOR (“Stabilization Force.” And don’t ask me why the military isn’t using real acronyms any more). We went as part of the U.S. Army’s “regional media visits” programs, flying for free from Dover Air Force Base in Delaware to Ramstein, Germany and from there to Tuzla, where the American forces are based. The program was free, as the Army basically requests the use of six seats on one of the regular U.S. Air Force flights across the Atlantic and from Germany to Bosnia. Chris had heard a rumor that a similar program had been run during Desert Shield, and a year after I first contacted Major Stanley Heath at the Pentagon â€“ the delay was due to fretting by my management â€“ we flew into Bosnia. Once there, Chris’ biggest contribution â€“ well, besides the photo stuff â€“ was pointing out “hey, look: Blackhawks!” whenever a helicopter flew over. Oh, and also recognizing a UN International Police Task Force member as a cop who’d once pulled him over in Virginia. A good story, gotten by serendipity. Working long days â€“ 12 hours was typical, although we worked longer â€“ we interviewed soldiers and Bosnians, getting a glimpse at what war has done to this country. “War torn” is one of those terms people like to throw around willy-nilly. Bosnia today is worse off than Cairo, Egypt, where I lived for 15 months. But Cairo has worked to reach its current stage of Third World squalor (“Third World” is another term used inappropriately. People compare DC to the Third World, although as bad as it is, it’s far better than genuine Third World conditions). The former Yugoslavia, on the other hand, was once the vacation paradise of the East Bloc. It’s as though the people of Switzerland â€“ the country really is that beautiful, with similar culture and style â€“ decided to tear apart Paradise. Many of the soldiers we interviewed said they’d opposed the Bosnian mission before being shipped there, but all but one said they thought we should stay longer, if only for the kids. The country has been ravaged, and the plight of the children hurts the soldiers most of all. Even the poorest Army Reservist knows his kids will have a better lives than the children who waved to us as we drove by in Army Humvees (which are really uncomfortable, by the way). When we pull out in a year or two (we will be staying longer than summer 1998, of course), everyone, Bosnians and NATO troops, expects the fighting to begin again. Everyone is exhausted by the carnage, but no one believes the other sides will keep the peace. The border areas we visited were quite scary, with a near-clash between Serbian police and Muslim villagers occurring before us. While it was frankly exhilarating to ride a C-130 into Bosnia or to drink Serbian beer in the town of Zvornik, it was hard to forget how dangerous everything really was, or to ignore the horror around us. Soccer fields looked like prairie dog fields from all the land mines (there’s one land mine for every two people), nine year old children’s graves were desecrated by opposing ethnic groups, an elderly couple the warring sides were consciously avoiding killing had to hide in their pig sty for several weeks as their entire yard and home were filled with shells and sweet kids still can vividly remember seeing the enemy (formerly their neighbors) sweep into their homes, killing their brothers and fathers. There are no easy answers there, but giving the Bosnians a chance to get on their feet, and to realize that peace is worth the effort, is critical. That’s not me talking: That’s the soldiers of Eagle Base, Tuzla and all the other camps around Bosnia. My sister googled my name and found this. What’s happening in your life? PS–I have all of the pix from our trip, want to add some visual jazz to it?